When pumping applications involve corrosives, abrasives, slurries or non-lubricating liquids Hydra-Cell seal-less, high-pressure diaphragm pumps are an ideal choice. Available from MICHAEL SMITH ENGINEERS, the Hydra-Cell range of pumps are suited to both high and low pressure applications and combine rugged durability with exceptional pumping accuracy. The range covers flow rates up to 140 lit/min at maximum discharge pressures between 70 and 170 Bar, depending on the model. The absence of seals, cups or packing eliminates the issues associated with seal failure and therefore lowers maintenance costs. They can also be run dry without damage.They have a compact, multi-diaphragm design which saves space and helps to reduce maintenance costs and also means that for most applications, there is no need for pulsation dampeners. They operate with true positive displacement for optimum energy efficiency (>85%), better than API675 for repeatability, linearity and steady state accuracy. 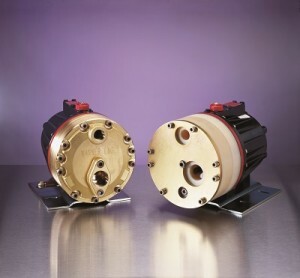 Hydra-Cell pumps are available in a wide choice of liquid end materials ensuring versatility in their ability to handle most ‘challenging fluids’ along with the flexibility to be adapted to a wide range of pumping duties. They have a proven track-record of robust and reliable operation in applications such as; metering, dosing, injecting and spraying chemicals, solvents, acids, hydrocarbons, natural gas liquids, alkalis, polymers, aqueous ammonia, resins, slurries, recycled or dirty liquids.